Exploring Greece as a Greek! A special guide made by locals for people thinking of making a trip to Greece and would enjoy traveling as a Greek would do. A guide that includes only a number of destinations around the country, some of them well known and some that are yet to be discovered accompanied by a few handpicked lodgings, restaurants and other places where everyone can enjoy the art of Greek Hospitality. A practical travel eBook that is dedicated to fun and relaxation and not on historical sites and visits of monuments. 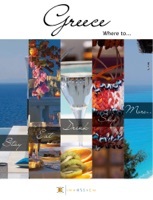 “Greece Where To…” will be regularly updated with more places to visit and enjoy. Finally I get this ebook, thanks for all these Greece - Where To... I can get now! Greece - Where To... was the best books I ever buy. Greece - Where To... did exactly what you said it does. I will recommend you to my colleagues. Greece - Where To... is the most valuable books we have EVER purchased. I'd be lost without this. I am completely blown away.